Bitmillion is an investment program that offers up to 15% returns on your investment per day. And you can allegedly make another 6% from other deposits via the referral program. BitMillion allegedly combines bitcoin mining, trading and marketing. So, is this a genuine investment opportunity? Some people might not want to hear it, but any program offering 15% daily forever is a scam. There is no other way. Even in the cryptocurrency space. 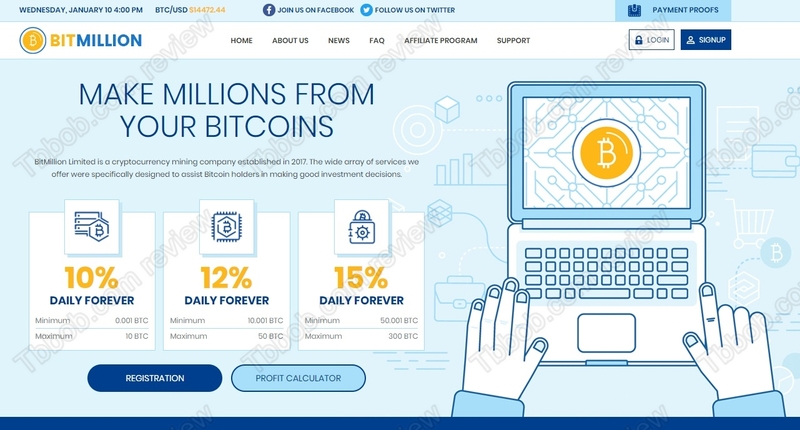 Moreover, BitMillion claims to be trading and mining Bitcoin, but its price is going sideways for several weeks, so there is very little room for profits. In fact, BitMillion is a typical Ponzi scheme. It means that new deposits are used for paying the profits, which of course is unsustainable in the long term. Such a scheme is doomed to fail, and so will BitMillion. Lately there has been a lot of scams with UK tax registrations and BitMillion is one of them. They show you a registration that basically means nothing. It is not even one year old. What is important is that BitMillion clearly is providing investment services, and that is a regulated activity. It requires a license from the Financial Conduct Authority, but as you can see on our image, BitMillion has no license, therefore it is an illegal business. BitMillion is a scam that is going to fail soon, and a lot people will lose their money in it. So, stay away from it! If you want to see what profits are possible in cryptocurrency trading, try a free demo account with a regulated broker. On the demo you will see that it is possible to make money in crypto trading, but not 15% per day.